Josh Neufeld has illustrated a lot of great graphic journalism (reportage in comic form), including The Influencing Machine (about the media), A Few Perfect Hours … and Other Stories from Southeast Asia and Central Europe (travelogue), and one of my favorites, Titans of Finance. His latest project, published last fall, is “Terms of Service: Understanding Our Role in the World of Big Data”. 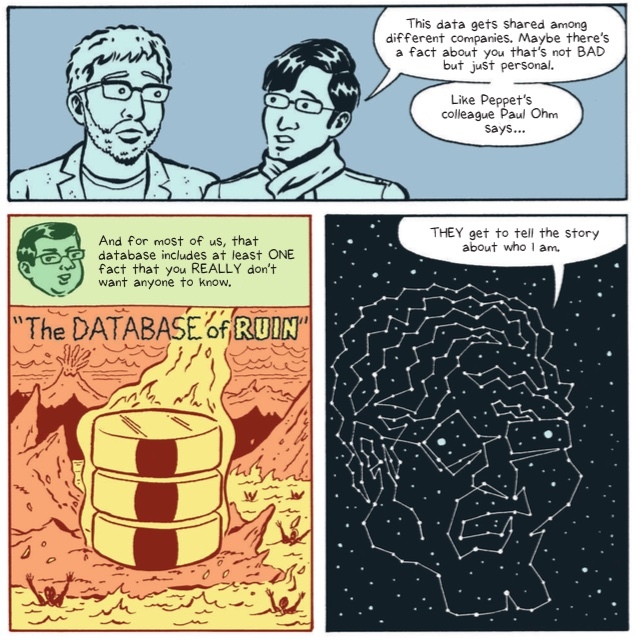 Co-written by reporter Michael Keller, this online graphic novella was published by Al Jazeera America and discusses the implications of sharing personal information online. It’s a lengthy, substantial, well-researched read, and I’m glad to see a news outlet sponsoring this kind of format. I hope they do more. There are some great questions raised and ideas explored here, including how easily privacy violations become standardized and expected and how there’s a kind of “digital peer pressure”, where others using services to interact with us incorporate our information in those services regardless of our choices. Who decides what story is told about us, once all these digital facts are connected? They’ve also made it available for download (click the cloud button with the arrow at the top right), a very smart idea for those of us who hate fixed-format layouts on our laptops. Ironically, to participate in the comments (as the author has done), you have to sign in with the kind of social media account they’re questioning.